Couscous pilaf with apricots, almonds, mint and cilantro. This is a tasty dish because of the sweet dried fruit and crunchy almonds. You can't beat roasted beets with lemon, garlic, olive oil, salt and pepper. 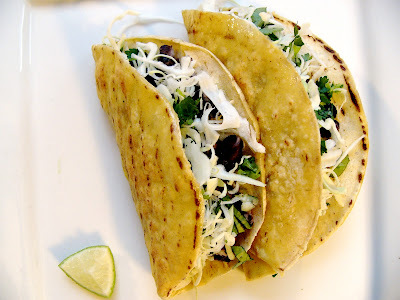 These tacos are so easy to make and look so impressively delicious- that you'll barely be able to sit down before diving into them. Here's a great recipe for holidays like Thanksgiving or Christmas, or simply the next time you're for some sprouted greens. Baked cauliflower with juicy tomatoes and feta cheese, need I say more? This dish nicely combines turmeric and cumin with caramelized onions, garlic and just a little jalapeno pepper. Mexican inspired and delicious, this is one of my favorites. 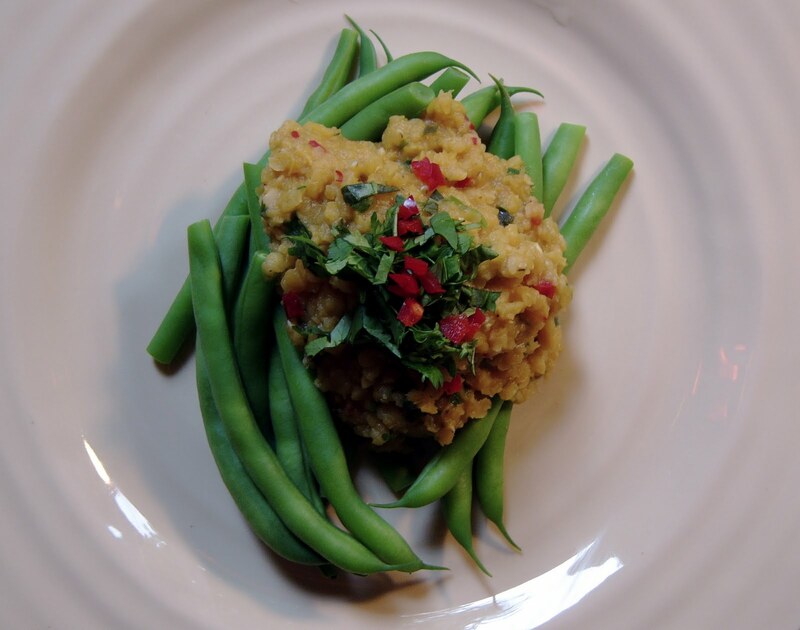 This dish has a little heat - curry powder, ginger and jalapeno - that is nicely balanced out with sweet potatoes and lentils. This has been one of my favorite recipes for a while now. Mostly because they're GOOD, but also because it really doesn't matter what you serve with them. This is one of my favorite comfort foods, baked eggplant layered with tomato sauce and cheese. A nice spring or summer salad with green beans and fava, broad or butter beans with a tarragon dressing. Vegetarian lasagna with mushrooms and spinach. This is a delightfully delicate tart that combines the flavours of leeks, goat and ricotta cheese, dill and chives. One of the reasons I like this recipe so much is the bed of green beans (or string beans) that the kaffir leaf and chili lentils rest on. Roasted squash with maple syrup, thyme and just a little good old butter. A delicious side to any meal and can easily be turned into a cocktail party appy by serving with toothpicks and a dipping sauce. Cherry tomatoes, mushrooms, spinach and tofu toss with pesto sauce. This is the healthiest and freshest tasting Pad Thai I've ever had. One bit and it will be hard to go back to take-out. Polenta with veggies (or Italian sausage) and tomato sauce is one of my favorite dishes, especially when I'm in need for a good dose of comfort food. By baking in the oven at a high temperature for a short time, the pesto and asparagus bond in deliciously sublime way. Here's a recipe that I created, using roasted squash, apples and a healthy handful of pumpkin seeds. This is one of my favorites, a rustic potato and tomato tart. It's a guaranteed crowd pleaser that looks fabulous and tastes even better then it looks. A classic Greek dish of spinach, feta and dill wrapped in filo pastry. A delicious rice filling baked in peppers creates a great vegetarian dish that could be served as a colourful main dish to a lunch or dinner. This dish contrasts the naturally sweet flavours of the potatoes, maple syrup and coconut milk with citrus and spicy flavours. Sweet chili-fried tofu with leeks in coconut and lemongrass broth. Heart-warming and delicious! This dish is a classic anytime of the year. This is my standard chili recipe, use it as your basic framework and play around with the ingredients. This is a great, inexpensive dish to make that always tastes good.